Only a small percentage of eCommerce website visitors actually convert into paying customers, increasing your conversion rate can lead to a significant increase in the number of transactions and therefore revenue from your website without having to increase the number of visitors. This website conversion rate calculator helps you calculate the conversion rate and estimate the revenue from the conversions. The website conversion rate is the number of paying transactions divided by the number of visitors. For example, if the number of monthly visitors to the website is 10,000, and the number of paying transactions (sales, orders etc) in the same period is 250, then the website conversion rate is 250/10,000 x 100% = 2.5%. The average monthly website website visitors are entered. This is the number of visitors to the website over the period. The average transaction value is entered. This is the currency value of an average transaction. A transaction can be defined to suit the business, for example it might be the value of an order, a sale, or a basket. The current total number of transactions is entered. The website conversion rate calculator calculates the current conversion rate based on the total transactions and the website visitors. It also shows the current total revenue, and the revenue per website visitor. The new website conversion rate is entered. This is the hoped for conversion rate following the results of work being carried out on the website to optimize conversions. The website conversion rate calculator calculates the new total transactions, total revenue, and revenue per visitor based on this new conversion rate. The final column of the calculator shows the increase in transactions, revenue, and revenue per visitor resulting from the website conversion optimisation. 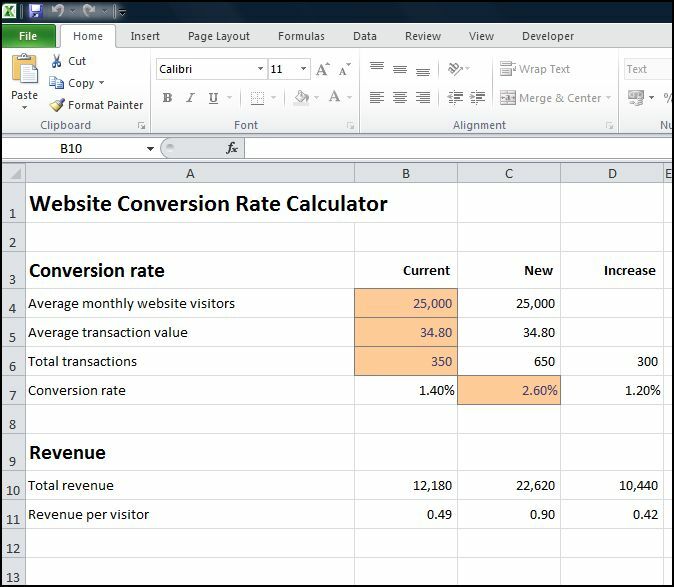 The website conversion rate spreadsheet is available for download in Excel format by following the link below. Users use this web conversion rate software at their own risk. We make no warranty or representation as to its accuracy and we are covered by the terms of our legal disclaimer, which you are deemed to have read. This is an example of an website conversion rate tool that you might use. It is purely illustrative. This is not intended to reflect general standards or targets for any particular company or sector. If you do spot a mistake in the website conversion optimization calculator, please let us know and we will try to fix it.